Updated with a new 12 week companion Bible study, Joanna Weaver's popular book shows women how to blend intimacy with Jesus and service for Him. How can you make that choice? 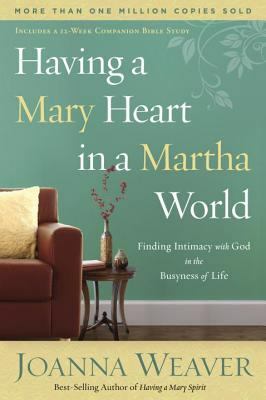 With her fresh approach to the familiar Bible story and its creative, practical strategies, Joanna shows how all of us-Marys and Marthas alike-can draw closer to our Lord, deepening our devotion, strengthening our service, and doing both with less stress and greater joy. Used Good (13 available) Shows some signs of wear, and may have some markings on the inside. 100% Money Back Guarantee. Shipped to over one million happy customers. Your purchase benefits world literacy!